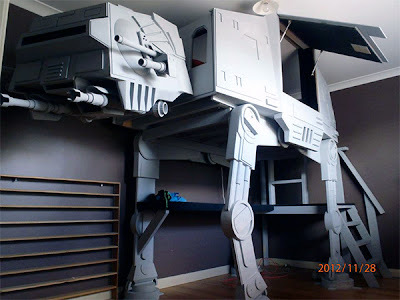 Sure this massive AT-AT bed may take up half the room if not more, but try parking its namesake in the garage! While others would have you believe it is for some lucky Anakin Skywalker aged fan out there, we all know the truth. Dad's built it for himself, and Mum's only sleeping inside so it doesn't scare the children. I want this so much. It's got a hatch. I can close a hatch. And lock it. Above ground. So many many layers of protection. The fact that it's an AT-AT is just cream on the cake. You could play act you're Chewie, blowing away Imperials outside the bunker on Endor. So freaking cool. yeah Random i saw this on your facebook page yesterday this is so awesome. seeing something like this brings back great memories of the early 80s. I want my Star Wars curtains back. And the sheets. Now I AM a Superman in my bed [thats my story, and Im stickin' to it]! But Id love to have a bed such as this - if only half my time would doubtless be spent trying to find a way into it. Its quite something, isnt it? Several comments about the man of steel aside, that is totally cool. I had to fight just to get Thor in the bedroom. Somehow I don't think I'll ever get an AT-AT. Maybe someday that really awesome Wampa rug on Thinkgeek. Yes we do know the truth. Another truth is that I want one. A Millennium would be even better.